This is the main operating position at W2NBC Radio. 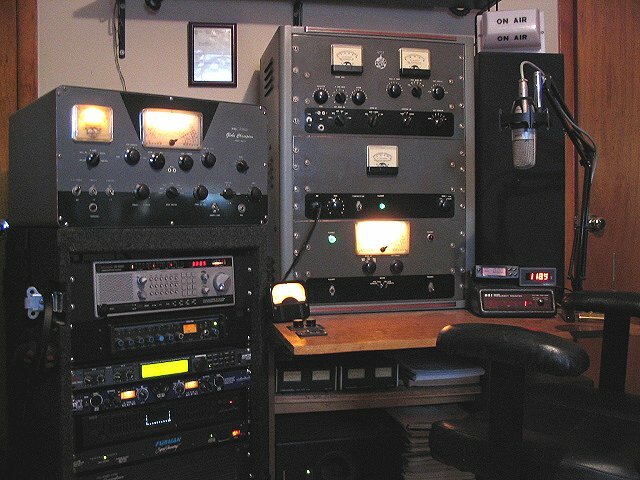 The large transmitter to the right is a WRL Globe King 500B circa 1956. The construction is modular as in there are three separate racks for VFO and High voltage , Modulator (with its own supply), and top mounted RF deck. I have owned this transmitter for over 6 years, and have done extensive audio modifications to the modulator deck, as well as increasing the plate voltage to the 811A's to achieve over 100 percent modulation with well rounded audio. The bandswitching on the VFO has been solid stated, with relays used to pull up the oscillator coils, making the frequency almost rock-bound steady. An added reduction drive makes VFO tuning a dream, and I highly recommend it. The transmitter to the left is a WRL Globe Champion 300-A. This transmitter is a real sleeper from World Radio Labs! It is a stoutly built 200 watt output-class piece, with a pair of rare (and expensive) Amperex AX9909's in the final. Luckily I have a few pairs of NOS tubes to keep her going for a while. As in almost all WRL transmitters, the dreaded audio restrictive "couplates" were removed, and line audio fed directly to the grid of the 6AQ5 driver. The modulator tubes were changed from a pair of 809's to a pair of 572B's at zero bias. The mod transformer has also been changed to a UTC unit with MUCH headroom, and caps were changed out for a total of 250 MFD at 1000 volts. Needless to say the transmitter sounds great, and it was a pleasure to work on and to operate! The receiver is a much coveted (by me) but much maligned unit made by Bearcat DX-1000. As delivered from the factory in the early 80's, this receiver was about as insensitive as you could get! The radio was "detuned" by the manufacturer perhaps to meet some obscure standards of phase noise, etc. After doing an alignment this is a wonderful radio! The audio and filter selection are perfect for AM, with 2.7, 6 and 12 KHz widths. The detector output is fed to an amplifier and speaker setup that will be explained below. The audio chain has the following components: The microphone is a large capsule condenser type by Shure model KSM27. Unlike many of the imported mics of the same type, this mic is designed for continuous service at 48 volts phantom supply. It is a beautifully balanced mic with incredible low end response. That is powered by and fed into an Art TPII tube preamp, which has an adjustable input impedance, that really makes a difference in frequency response. That is then fed to the "glowing green" lcd panel you can see in the rack, which is a DBX Quantum. This is a pure digital box, with compressor, limiter, EQ, De-Esser and and the abilty to save favorite programs based on band conditions.The mixer above that unit is a Shure M367, that is used to feed the Globe King mic output, and the 300-A line level. The rack gear is powered by a Furman AR-117 line regulator that does a great job of keeping the AC steady at 117 volts. How do I hear the great audio from other AMers? With a 200 watt Soundcraftsmen 3 fed by a room equalized graphic EQ with spectral display, sub-woofer, and 4 speakers that surround the operating position. The cluster of gear on the desk includes a digital wattmeter, frequency counter, and line voltage monitor. And the vintage VU meter makes it all come together!